Searching for warmer weather, moving closer to adult children and grandkids or pursuing a change in scenery are just a few reasons why many Americans choose to move in retirement. These retirees often relocate for emotional reasons, but it’s important to consider the financial impacts, too. If you have a desire to pull up roots in retirement, pause to think about the following financial items. Consider the costs to sell your home. Even if you’re downsizing, trading spaces comes with a price tag. Staging, finding a realtor, hiring a moving company and cleaning services are all expenses that may be key to putting your home on the market. You may need to be prepared to manage two mortgages for some time or be ready for a quick closing time frame depending on the housing market in your area. Be strategic about the long-term financial effects. If you make a profit on the sale of your current home, use the money to fund one of your financial goals. Adding it to your retirement fund, investing it to pay for your grandkids’ college education, or putting it into a trust are some of the many ways the windfall can accelerate achieving a financial milestone. If you acquire a higher mortgage to purchase your new home, map out how the additional debt impacts your retirement long-term. Ideally, you’ll be able to absorb the increased cost without compromising your retirement lifestyle. Know the potential tax impacts. Moving across state lines can change how much you pay in taxes. This is particularly true for retirees because there’s wide variation in whether and how much states tax retirement income. Property and income taxes can also vary, which may be important if you plan to work or own a business in retirement. 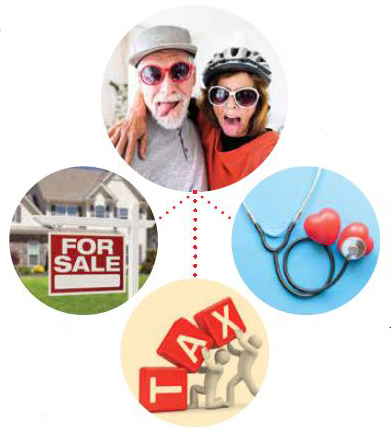 Check with your tax professional to assess the tax impact of your new locale. If you sell your current home and it has appreciated in value, discuss whether you owe a capital gains tax. Research health care services in your new location. Ask your medical insurance provider if your plan covers the services, specialists, prescription drugs and medical clinics that you need near your new home. The quality of care and cost may be different than what you’re used to, so it’s important to do your research. Additionally, it’s worth thinking about the long-term care and assisted living facilities that are nearby. Even if you hope to age in your new home, knowing your options can be crucial in case you or your spouse experience an unexpected medical event. Account for your retirement lifestyle. The reason many retirees move in retirement is to live out a lifestyle they have dreamed about for years. As you decide whether you want to move, be prepared for additional expenses to travel, invest in a hobby or start a business. Your food and entertainment spending may also increase as you fill your newfound time and explore your new city. Moving to pursue your retirement dreams is exciting, but there can be a lot of factors to consider in deciding when and where to purchase your new home. For expert help reviewing your options, connect with a realtor, financial advisor and tax professional.